Taking a closer look at severe loss-of-function mutations revealed the contribution of both inherited (yellow pieces) and new (red piece) mutations to the puzzling genetic architecture of schizophrenia. Credit: Lab of Maria Karayiorgou, M.D., and Joseph Gogos, M.D. Maria Karayiorgou, MD, professor of psychiatry and Joseph Gogos, MD, PhD, professor of physiology and cellular biophysics and of neuroscience, and their team sequenced the “exome” — the region of the human genome that codes for proteins — of 231 schizophrenia patients and their unaffected parents. Using this data, they demonstrated that schizophrenia arises from collective damage across several genes. 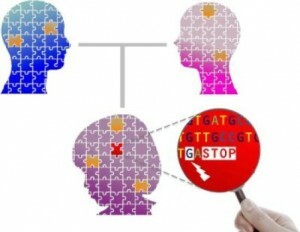 The researchers compared sequencing data to look for genetic differences and identify new loss-of-function mutations — which are rarer, but have a more severe effect on ordinary gene function — in cases of schizophrenia that had not been inherited from the patients’ parents. They found an excess of such mutations in a variety of genes across different chromosomes. Using the same sequencing data, the researchers also looked at what types of mutations are commonly passed on to schizophrenia patients from their parents. It turns out that many of these are “loss-of-function” types. These mutations were also found to occur more frequently in genes with a low tolerance for genetic variation. “These mutations are important signposts toward identifying the genes involved in schizophrenia,” said Dr. Karayiorgou. The finding fits with accumulating evidence that damage to chromatin regulatory genes is a common feature of various psychiatric and neurodevelopmental disorders. By combining the mutational data from this and related studies on schizophrenia, the authors found that “chromatin regulation” was the most common description for genes that had damaging mutations.